Bryanston School in Dorset decided that something had to be done to allow the school to track and check its growing stock of IT equipment. As a result, they decided to label laptops on their site not just with the school’s postcode but also with the name of the student who owned the computer. 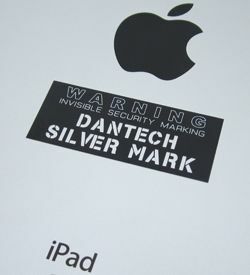 Over the subsequent period, they have also labelled iPads, iPhones and hard drives, using ID SILVER MARK labels throughout. A key issue, of course, was ensuring that no one simply removed the labels. Security marking with ID SILVER MARK labels are ideal as if the label gets peeled off, the UV paint still shows the schools postcode and pupil name. What’s more, it is also ideal for tracking equipment if it goes missing. In other words, the ID SILVER MARK allows you to protect your valuable equipment with a permanent visual security marking. Obviously, it is nice for us when a school actively recommends our system of marking and tracking, but that’s not the only recommendation we get. The Police and Insurance companies have noted that the ID MARK conforms to Home Office Guidelines - by using your school name and postcode as a way of identifying your property, this helps with item recovery in case of theft. ID SILVER MARK is available in black or silver materials with permanent adhesive. All Dantech asset identification labels are personalised with your school name and logo as well as sequential numbering or barcodes. If you would like to know more please do get in touch – we are very happy to discuss your marking requirements throughout the school. Just call Dantech on 01354 688 488 or complete our contact form for free help and advice.